Here's something to chirp about! Dress up your Mini Bird Crazy shapes with seasonal and holiday themed pieces! Perfectly cut and frame right to the stamped edge. Set includes key additional pieces such as hats, glasses and ties to layer for endless creative possibilities. 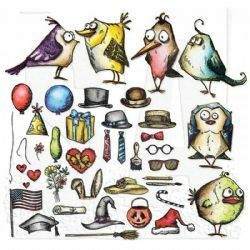 This set has been specially designed to work perfectly withMini Bird Crazy & Things CMS250.